... that a measurable uncertainty, or 'risk' proper, as we shall use the term, is so far different from an unmeasurable one that it is not in effect an uncertainty at all. Economists have now forgotten that a world of uncertainty generates a strong incentive to delay choices. We do not make immediate choices informed by some probabilistic expectation of future outcomes. We usually can’t even know the potential scope of future outcomes. That means we delay choices to keep options alive, miss good opportunities, and sometimes commit to poor investments. Because time is irreversible, unlike in economic models, when we commit to decisions matters as well as the decisions themselves. But the ignorance of uncertainty is evident in other social sciences as well. Approaching problems in philosophy and ethics without acknowledging uncertainty has lead to many seemingly intractable puzzles that are easily resolved in a world of uncertainty. I hope that observing the crucial role uncertainty plays in these contexts encourages economists to take the concept more seriously and see the economy as a dynamic environment, rather than a static one. In ethics, the Trolley Problem has occupied the minds of philosophers for decades. In its simplest form, the puzzle is as follows. In Scenario A a trolley is barreling down the tracks towards five people who will be killed unless the trolley is stopped. Luckily, there is a fork in the tracks, and by simply pulling a lever, the trolley can be diverted onto a second set of tracks. Unfortunately, there is a single person in the path of the tolled on this track who will be killed if you pull the lever. Most people in this scenario would not push the man off the bridge, even though the same welfare gains in terms of lives saved would be the same as Scenario A (so you know, 68.2% of philosophers would push the man to save the five). Some philosophers and psychologists put this down to a ‘dual-process’ theory and for some reason that two different setups invoke "the operations of at least two distinct psychological/neural systems". Fundamentally the incompatibility of these two outcomes arises because we are presented with a dilemma in terms of risk, or knowable probabilities. In fact we have point distributions at perfect certainty for each outcome. You push the fat man off the bridge (assuming away the logical problem that a man fat enough to stop a runaway trolley is somehow easily able to be pushed off a bridge) you have a probability of 1 that the man will die and the trolley will be stopped. If you don’t, you have probability 1 that the five people on the tracks will be killed. When you add risk by looking at possible probability distributions of choice outcomes you can generate the a balance of risks that predicts survey responses. This is a step in the right direction, since we know it is very difficult for people to comprehend the idea of perfect certainty. But it still overlooks the dynamic nature of true uncertainty. A very simple resolution to arises when we add a time dimension to the problem, which is what is required under uncertainty. We can think in terms of an option-tree expanding over time, with choices unable to be fully anticipated in advance. We can see in the diagram below that in Scenario A, switching the tracks leads to a new situation that opens up the set of possible choices in the grey shaded area while eliminating others. Switching the trolley onto the side track buys time and keeps options open without killing anyone. In Scenario B, most people choose not to push the fat man. Here what the are doing is buying time before anyone gets killed. Even after the decision is made not to push the man, there will be time available for many other as-yet-unknowable situations to arise. People are making choices in a way that allows them to navigate through a choice space over the irreversible dimension of time. I’ve highlighted in red a possible path for each scenario that could be envisages in the mind of somewhat making choices in a world of uncertainty. In both cases there is an unknowable chance that a resolution to the dilemma will involve no death if the dynamic choices that arise are navigated appropriately. But choosing to push the fat man in Scenario B eliminates the option of resolving the situation without any deaths. We know that buying time to keep an option open is a strong impulse. 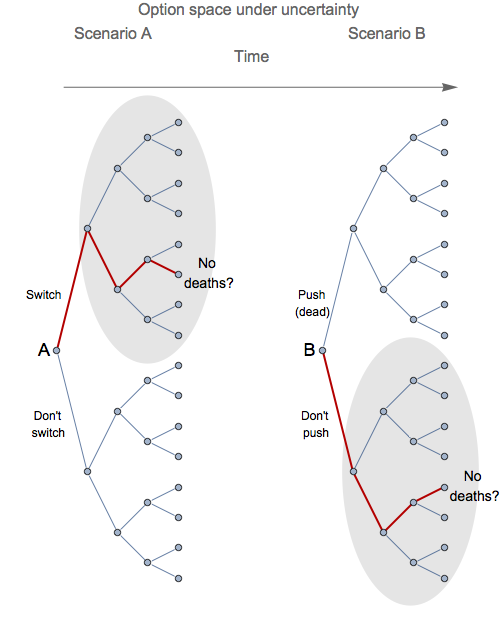 In experiments where participants are given the choice of which of two identical drowning swimmers to save, knowing they can only save one, many are unable to make the decision in a timely enough manner and instead spend their time searching for better information in the hope of maintain the option of saving both, but in doing so letting them both drown. Because the choice to commit to save one swimmer is associated with a commitment to allow the other to drown, the logical choice is to delay to maintain the option of saving both. In military training overcoming this instinct to delay choices to keep options open forms a integral part of the psychological training. Soldiers are known to delay making any choice in high-stakes combat dilemmas, what amounts to ‘freezing’, or in many cases they shoot to deter rather than to kill, to keep open the option of finishing a battle with fewer deaths in general. …most emergencies are, or at least begin as, ambiguous events. As the bystanders are deciding whether an event is an emergency, each bystander looks to the others for guidance before acting. … Seeing others remain passive causes the bystander to interpret the ambiguous situation as non-serious. So it is not that anyone does not want to help, but as each person individually chooses to delay their actions to gain new information, they observe others doing the same thing. By observing others they gain the new information that the situation is non-serious, and hence as a group they ultimately choose a path through the choice space over time that resolves to a belief that the situation is a non-emergency. What happens as people delay choices here is a cascade of new information that changes the decisions of each individual and the group as a whole. In sociology there are many simulation models of these type of choice cascades, from standing ovations, to riots, and other herding behaviour including musical tastes, and crucially for economists, asset market speculation. Uncertainty is a primarily a concept about choices in a dynamic environment. Here I have shown that human behaviour is adapted to our dynamic irreversible environment, and as such, uncertainty is required to understand behavioural logic, morality, and sociability. Moral puzzles resolve easily in an environment of uncertainty, and many psychological phenomena, from soldiers freezing in battle, to the bystander effect, to our taste in music, can been seen to arise from a result of human tendencies to delay decisions in order to cope with uncertainty. It is not just economists who have acknowledged that uncertainty is tremendously important, but then later ignored the concept in their analysis. Given the high stakes arising from political choices based on economic analysis, putting uncertainty front and centre in a new dynamic economics is critical. presented moral dilemma is a fake one: What if all five people have terminal cancer and tied them-self to tracks because they want to die - stop suffering? What if one of five people that is going to be saved is Hitler? What if fat person is Jonas Salk? What information is required to make right utilitarian moral decision? Contemporary moral issues are not so much products of ignorance about risk and uncertainty, but rather much more of ignorance about basic moral principles. The very fact that nobody is questioning validity or practicality of basic utilitarian ideas is a clear symptom of this. Who gives someone a "moral right" to take someone's life for greater good, higher utility? Thanks to its shortcomings, utilitarianism has been successfully used to justify all evils of modern world (always for the sake of common or greater good; e.g. from holocaust, via Iraq interventions to bank bailout). Once we look outside of the dominant ethical doctrine of utilitarianism (of any kind consequentialism and intentionalism) we may find the way out of our moral darkness. All of rational (and emotivist) moral theories (from Kant onward) miserably failed to provide replacement for the lost religious and traditional customary morals that west rejected during "Enlightenment". It seems that the only practical way to provide moral guides to irrational human beings is by virtues; the only way for someone to make good moral decisions under various conditions (availability of information, knowledge, emotional conditions, state of mind, ...) is to be good and virtuous human. Outside of the utilitarian moral world Trolley dilemma doesn't even exist. A virtuous man would always make the best possible moral decision. I agree that utilitarianism provides an insufficient grounding for proper moral reasoning. I have written about this before. But I still think that the risk-uncertainty conceptual difference underlies much confusion. Donald Rumsfeld was always roundly mocked for his distinction between known unknowns and unknown unknowns, and I could never understand why. Seemed like that was one of the smartest things he ever said. I feel like the processes you describe explain my investing behaviour. When is the right time to sell my shares in order to rebalance my portfolio? I'm not sure. So I delay making a decision to wait for more information, all the while ruing missed chances. Coaches’ Calls: Should debt be on the scoreboard?